Fits Most Armless Dining Room Chairs up to 18-inches wide. Add some fun to your next brunch, dinner, or birthday party this EASTER season... Sure to bring smiles to everyone who sees them! 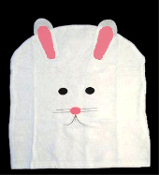 Cute bright white and candy pink Bunny head covers are an easy and festive way to dress up chairs and delight kids and guests of all ages. Can also be used as pillow slipcovers!